RainSoft dealer Curt Wunder (left) and Atlantic City Mayor Lorenzo Langford passed out bottled water to residents of the New Jersey seaside community who were affected by Hurricane Sandy. 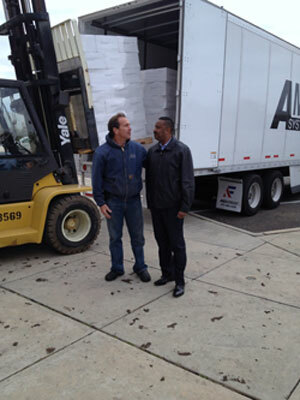 Elk Grove Village, IL – November 7, 2012 – Recognizing the call for help with supplies to help residents in New Jersey impacted by Hurricane Sandy last week, RainSoft has delivered a semi-truck load of bottled water to residents of Atlantic City. A total of 20,700 bottles arrived at Sandcastle Stadium, where local RainSoft dealer Curt Wunder led efforts and distributed the water to several relief centers. Wunder owns Atlantic Water Products, which has an office in Mays Landing and services customers in southern New Jersey. Assisting Wunder and his team was RainSoft regional director Dan Pfister and Charles Haney, a former RainSoft dealer and owner of the Melting Pot Restaurant in Atlantic City, which was destroyed by the storm. Headquartered in Elk Grove Village, Illinois, RainSoft, a division of Aquion, Inc., is an international company with over 150 authorized and independently owned dealerships in the U.S. and 20 other countries. The company is dedicated to producing the world’s finest water treatment systems, all of them manufactured in the U.S.A. and backed with the industry’s strongest lifetime warrantees. For more info, visit www.RainSoft.com or call 1-800-RAINSOFT.